Toshiba UK is aiming its first detachable ultrabook at the business market with the launch of the Portégé Z10t. Running on Windows 8 Pro, it has an Intel Core processor for Ultrabook and a high definition 11.6-inch screen. Toshiba says it has been designed for mobile workers, with a spill-resistant keyboard, SSD design that does not rely on moving parts, and a number of security and protection features. It can be used as a laptop or tablet, with backlit keys for use in low light, and a touchpad that responds to scrolling, zooming and swiping through documents. An additional Accupoint provides the option of more precise cursor control. 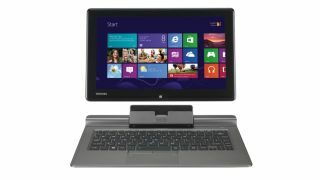 Toshiba says it can be used for work on presentations, spreadsheets and basic multimedia tasks in tablet and laptop modes. An optional DigitizerPen can be used for onscreen notes, and the Z10t's handwriting recognition feature can convert them into editable digital documents. The pen can also be used for sketches. It also includes a range of pre-installed security and data management features, including Intel Anti-Theft to reduce the risk of unauthorised access, and the Trusted Platform Module to protect locally stored data. Intel vPro technology is integrated into the processor to increase security levels, including the ability to disable the device remotely, and allows IT departments to monitor, maintain, repair and upgrade the machine. Other features include USB 3.0, HDMI and RGB ports, and Intel Wireless Display technology for sending files to a compatible TV set. The Portégé Z10t supports Gigabit LAN, HSPE and LTE wireless technologies.